What does it mean to be a creature of habit? Habits allow us to tackle the everyday challenges we face in life. We have evolved from animals that use their natural instinct to survive. Habits come from repetition; what we did yesterday, we will do today whether it is necessarily a positive or negative decision. I once heard someone say that habits are like submarines, they are silent and run deep. It would be wonderful to say that habits are not necessarily bad but unfortunately they usually happen because we have not thought of an alternative. We automatically carry out the action our brain tells us instead of doing what we may have actually planned. 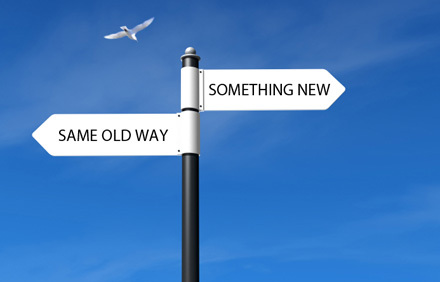 The proverb ʻold habits die hardʼ sums up how we find making changes in our lives difficult. How do we know how to change a habit or what to change it to if we have not had guidance or gained an understanding of why? Having a habit defers responsibility for our actions; ʻI drove to work because I left too late to cycleʼ or ʻMy stressful job means I cannot quit smokingʼ are classic excuses for not changing a way of life. We like the comfort of our car or are addicted to nicotine which is why we have not managed to break the habit. Our animal instinct is to naturally do what is easy. Feeling comfortable in society guides our brain to know what we should do verses what we actually do. The worldʼs behaviours have changed the place we live in, to a large extent, for the worse. Be it eating habits resulting in obesity, travel habits resulting in climate change or consumption habits resulting in an economic recession, a creature of habit has a brain that is on autopilot making decisions through automatic responses. I have been using design to help people change their habits for a better future and it is clear from what I have observed that habits are formed due to repetition. A creature of habit searches for easy options. It is easier to embrace an action that makes them feel comfortable instead of one that disrupts their daily routine. Looking at creatures of habit from a positive angle, habits do not only happen but can develop and be changed. Using empowerment to help people gain a deeper understanding of our habits can result in new habits for positive effect. If we understand what motivates and incentivises people to change their habits, good results can be achieved. A project I have been working on focuses on motivating employees to change their attitude in the workplace. We are incentivising them to build communities around using less energy. This is a good example of how old habits can be changed and new ones created at local level. New habits can also be created at governmental level. New policies have forced us to create habits; recycling laws mean we are expected to separate out our waste. It could be argued that recycling is now a habit due to repetition where as a number of years ago it was seen as a disruption. A creature of habit is simply a being that repeats their actions to the point where they may not think about carrying out that action. If the habit is harmful, awareness and motivation is required to change the habit. If the habit is beneficial, it must be encouraged.